UK scientists have developed a process for making hydrogen from sunflower oil which could prove an important future source of eco-friendly energy. A University of Leeds team says the development could make hydrogen-powered vehicles a more realistic proposition. The researchers envision a small unit inside a car that would pull hydrogen out of the oil to drive a fuel cell. The team has presented details of its research to the annual meeting of the American Chemical Society. As petroleum supplies gradually dwindle and the impacts of global warming become more pressing, the arguments in the eyes of some people for moving from an oil-based economy to one based on hydrogen become more and more persuasive. But making hydrogen can be expensive - and with some methods will produce as much greenhouse gas as oil-burning itself. "The production of hydrogen from biomass and bio-oils represents a realistic renewable source," said Dr Andrew Moss, a member of the research team at Leeds. "This particular process could enable hydrogen to be produced from vegetable-oil-derived materials by either stationary fuel processors, or even on-board processors in fuel-cell cars." These cars of the future would have a tank full of sunflower oil, or some other bio-oil, that would be turned into hydrogen as you drove along. The hydrogen would power the fuel-cell motor - the gas being combined with oxygen in the cell to produce electricity and water. 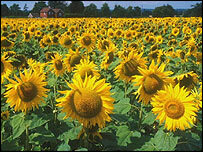 The Leeds method does produce some carbon dioxide, but growing more sunflowers absorbs it again from the air. The process employs nickel and carbon-based catalysts to orchestrate a chain of chemical reactions that ultimately liberate the gas from the hydrocarbon molecules that make up the oil. The Leeds team has shown the technology can work, and believes it can be miniaturised to the scale necessary for in-car use. "Instead of using hydrogen storage on the vehicle you would use a conventional liquid [bio-]fuel," said Dr Moss. "This takes away one of the problems of hydrogen storage." An uncompressed hydrogen gas fuel tank that contained a store of energy equivalent to a petrol tank would be more than 3,000 times bigger than its conventional cousin - which makes this latest approach attractive. But many obstacles remain before the sunflower car becomes reality - not least the cost. The process uses some moderately expensive materials, and in the short term, petrol will certainly remain the cheaper option.